Hôtel Louvre Richelieu is located in central Paris, facing Jardin du Palais Royal and less than 500 metres from the Louvre and 800 metres from the Seine River. It offers free Wi-Fi access. With a contemporary design, the guest rooms include a TV, and a private bathroom with a shower. All rooms have a wardrobe, safety deposit box. Comfort Rooms also include air conditioning and a rain effect walk-in shower. A buffet-style breakfast is served daily in the dining room. An express breakfast option is also available in the lounge. 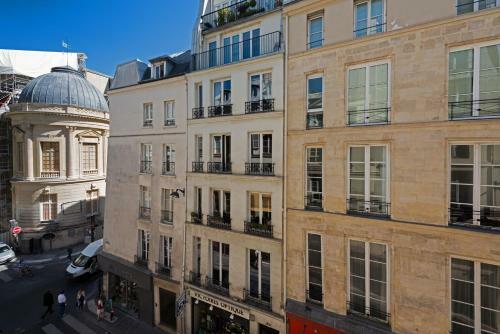 Hôtel Louvre Richelieu is within walking distance to many of Paris’s attractions, including Notre Dame Cathedral, a 20-minute walk away and Opera Garnier, which is 650 metres from the hotel. Metro Station Pyramides is 350 metres away, giving guests direct access to Gare du Nord and the trains going to Charles de Gaulle Airport. A private car service is available upon request. This room features a modern décor, free Wi-Fi access and a modern bathroom with a shower. Extras include an LCD TV. Rate: € 109.00 ... € 310.80; select dates below to get current rates. This room features a modern décor, free Wi-Fi access and a modern bathroom with a rain-fall shower. Extras include air conditioning and an LCD TV. Rate: € 134.25 ... € 310.80; select dates below to get current rates.